Beginning November 2016, you can enjoy an exhilarating and enchanting cultural journey celebrating the legends, people and natural wonders of Hawai’i during KA WA’A – A Lū’au at Aulani, A Disney Resort & Spa. It’s an unforgettable evening of family entertainment as only Disney can offer. The festivities begin on Hālāwai Lawn with pre-show activities. Then, get ready for a full evening of song, dance and storytelling as they enjoy a lavish Hawaiian feast. The buffet dinner includes a carving station with suckling pig and prime rib, fresh local seafood, authentic island fare and enticing Asian specialties, plus family-friendly offerings, kids’ selections and a decadent dessert bar. KA WA’A Lū’au is currently available only to Guests of Aulani. Performances are held on select nights, weather permitting. Seating will be assigned upon arrival. The experience lasts approximately 3 hours. The price for general seating is $119 for adults and $79 for children (ages 3-9). The price for VIP seating is $159 for adults and $109 for children (ages 3-9). VIP seating includes early seating at 5 p.m. General seating begins at 5:15 p.m. The prices include gratuity. Cancellations must be made 48 hours in advance. 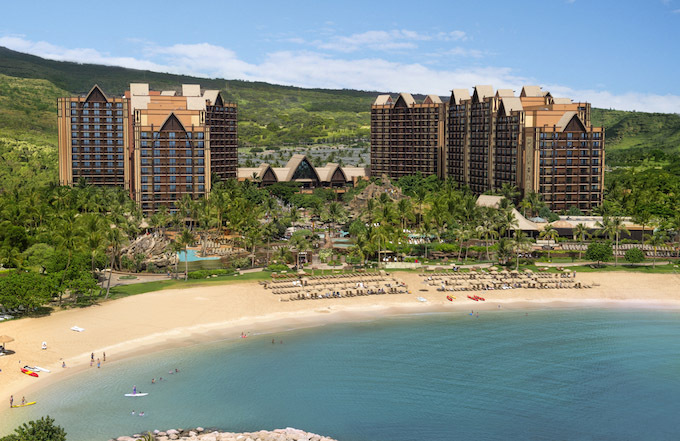 Experience Disney in Hawaii with Ohana! Posted on October 28, 2016, in Aulani, Culture, Hawaii, kids travel, lual, Luxury, Mahalo, pack your bags, Polynesian, Spa, travel hut wendi, vacation. Bookmark the permalink. Leave a comment.